Are Student Loans Really Killing the Housing Market? It's obvious: Student debt is crushing demand for homes. So, why doesn't the realtor data show it? Here's a simple story about student debt and the U.S. economy that you might already know. Standing tall at $1.2 trillion, the student loan monster has tripled in size in the last decade for two reasons—more students and more debt. Seventy percent more students are getting loans, and the typical borrower is taking on about twice as much. All this debt from school might pay off with higher wages for graduates, but today this wall of debt is preventing students from getting on with their lives. Since student debt is concentrated among young adults who are likely first-time home-buyers, it's particularly devastating to the housing market. This is a story I believed, because I read it over and over—from the Wall Street Journal, Bloomberg Businessweek, the Brookings Institution, Realtor magazine, and the New York Federal Reserve. I also believed it because it made a lot of sense. The housing market needs new buyers, and those new buyers need new debt. But if they're wracked with student debt, already, they won't buy homes, and the real estate business is toast. It's a plausible narrative backed up by one key factoid I'd seen everywhere: That first-time buyers used to account for 40 percent of the housing market, but now they make up just 30 percent. But ... wait. This simply can't be right. First-time home-buyers still skew young—the median age is 31, approximately what it's been for a decade—and young people clearly aren't buying as many homes as they used to. We have every reason to believe that the decline in homeownership is related to the incredible rise of student loans among young and middle-aged households. Student debt can prevent some young borrowers from taking on debt and student debtors tend to have worse credit scores, as a new working paper from the Brookings Institution argues. This whole thing seems like a paradox: Student debt is destroying demand among first-time buyers, but it's not affecting their share of the market. What the what? Here's one explanation from an economist behind the numbers. 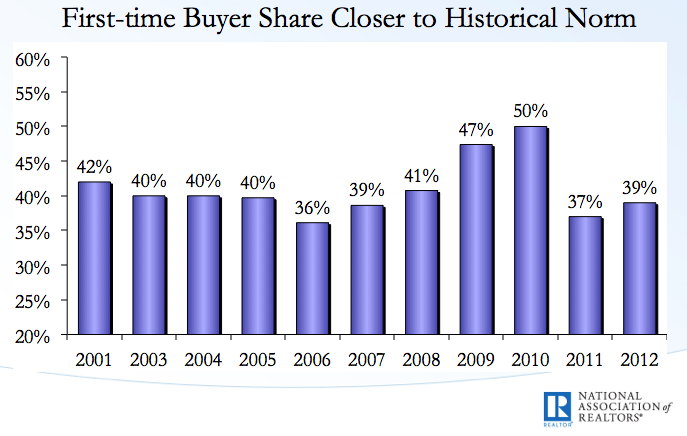 “The share of first-time buyers appears to be only modestly below normal," said Lawrence Yun, NAR chief economist. "But we have to keep in mind that investors have been more active in recent years, and they’re not included in these results." Who are these investors not included in the household realtor numbers? They're big companies like Blackstone and American Homes 4 Rent who are going out and paying all-cash for thousands of cheap distressed properties. Thanks to these behemoths gobbling up homes without any use for mortgages, all-cash home purchases have grown to 50 percent of the market, the highest on record. Corporations are acting like people, buying up enough existing homes and contributing to rising prices in metros across the country. Meanwhile, the share of 25-34-year olds with homes has fallen by 15 percent since 2005. And so what appears to be a paradox with student loans and the housing market isn't a paradox, at all. First-time home-buyers make up a historically normal share of new home-owner families, but a historically small share of new home-buyers, because a big slice of the housing market is owned by big institutional investors who aren't living in the homes they buy. This also suggests that student loans are depressing demand for homes, but only slightly more than the overall market for homes is already depressed for various reasons, like under-employment, tighter lending standards, and a general shift away from ownership. Consider this telling graph (via the New York Fed) showing the share of student-debtors with mortgages. It's fallen by five percentage points since 2008. But look at the non-student-debtors: Their appetite for mortgages is just as low. In short, there are two housing markets in America. It's not one for student debtors and one for non-student-debtors. Rather, it's one market for healthy corporations, who are buying at a historic rate; and one market for families, which is still quite sick—except for richer folks who are more likely to qualify for loans or have the cash to pay in full.